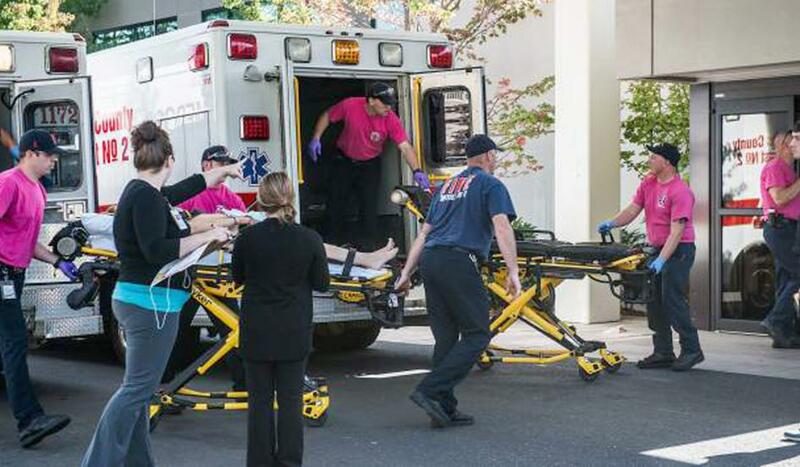 An all too familiar American scene: victims of a mass shooting taken to a hospital in Roseburg, OR. Another mass shooting, this time at Umpqua Community College in Roseburg, Oregon, has brought gun violence to the front page. At least ten people were killed, including the gunman, and another seven were injured. President Obama responded to the carnage forcefully, preempting the standard gun lobby responses that the answer is more guns and that it’s inappropriate to score political points off of tragedy. The first claim, that more guns are the solution, is pretty thoroughly debunked so it hardly needs addressing here. The second claim, that it’s cheap to score political points off of tragedy, is truly a refuge of the scoundrel. No matter how many hearts, homes and lives are broken, Americans are told the last thing we should do is take the opportunity to discuss changes. This has been particularly true during mass shootings, but the point has also come up in the aftermath of natural disasters and even acts of terror. If we had a more meaningful discussion, we might have realized that decades of sanctions, military intervention and support of dictatorships have helped foster animosity toward us in the region. Perhaps we’d have taken a more sophisticated approach and pursued a peace process. Instead, we enhanced our regional presence enormously, launching two wars and creating strife sufficient to birth new and deadlier terrorist movements. Surely there is no justification or excuse for an act as heinous as 9/11. But any effort to point out that U.S. foreign policy hasn’t exactly endeared us to much of the Middle East was treated as terrorist sympathizing. The period during which it was considered almost treasonous to bring up those points seemed to last forever. 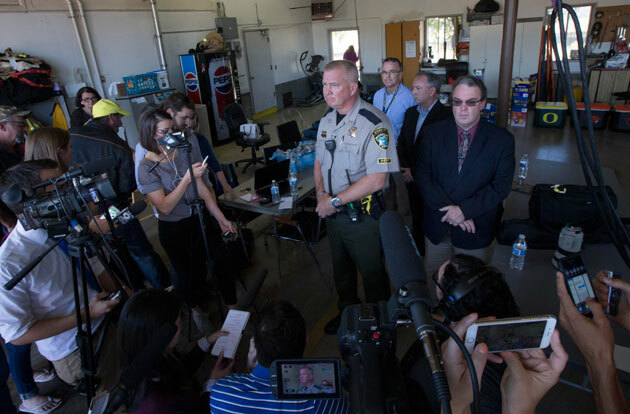 Roseburg Sheriff John Hanlin addresses press following the attack. Hanlin has previously been a vocal 2nd amendment defender and even shared a video on social media alleging the Sandy Hook shootings were a hoax. Sometimes, those grace periods never end. As far on as the 10th anniversary of Hurricane Katrina, Louisiana Governor Bobby Jindal wrote a letter to President Obama requesting that he not make any remarks on climate change. Not only was Katrina strengthened by warmer temperatures on the ocean’s surface, some 2,000 square miles of Louisiana wetlands have already been swallowed by rising sea levels. We simply can’t remain hostage to a culture where it’s impolite to discuss the causes of disasters like these. Tragedies are often emblematic of the political point being made. When environmentalists argue that climate change will cause extreme weather and then that extreme weather hits, it’s a real-world validation of the theory. Conservatives, who have taken to hiding from reality, must insist the debate be held at another time because it’s hard to win when they’re waist-deep in a flooded New Jersey street. Mass shootings now happen in the U.S. at an estimated rate of about once every other week. Part of the problem with not discussing tragedy when it happens is that our tragedies come so frequently there’s hardly a chance between them to cool off. Don’t count on the gun lobby having a change of heart after Roseburg. It’ll be interesting to see, though, whether Roseburg Sheriff John Hanlin changes his mind. In response to President Obama’s remarks on Sandy Hook, in 2013 Hanlin vocally defended gun rights, saying, “Gun control is NOT the answer to preventing heinous crimes like school shootings.” Hanlin even posted a Sandy Hook conspiracy video to his Facebook. This is what makes the right’s insistence that we not discuss politics during a time of tragedy so insidious. If it suits their interests, they won’t hesitate to cast blame for a tragedy. At the same time as the gun lobby blasts the left for insensitively suggesting gun control after a shooting, they cry out for less gun control. Both positions are political in nature – what makes it OK to call for more guns after a shooting but impolite or insensitive to call for less? Something is seriously wrong with a country that has become used to the routine of mass shootings. Our political system right now is too broken, corrupt and obstructionist for any meaningful change, but tragedies can provide the impetus for political will. Respect for families affected by tragedy doesn’t have to be compromised. In fact, there is no better way of honoring victims than by doing all we can to ensure no one else meets their fate.